Cut Beef into 1/6 inch strips, and place in a with the marinate recipe from above. Marinate for at least 2 hours. After steak has marinated, set grill to 450 degrees and using a grill basket, grill the steak and cook thoroughly. Steak must read 145 degrees on a thermometer before serving. Place a bit of Lettuce in the bottom of the bowl. Bean sprouts to taste, pickled carrot and radish, Fresh Cilantro sprigs, Jalapenos if using them, and cucumber. 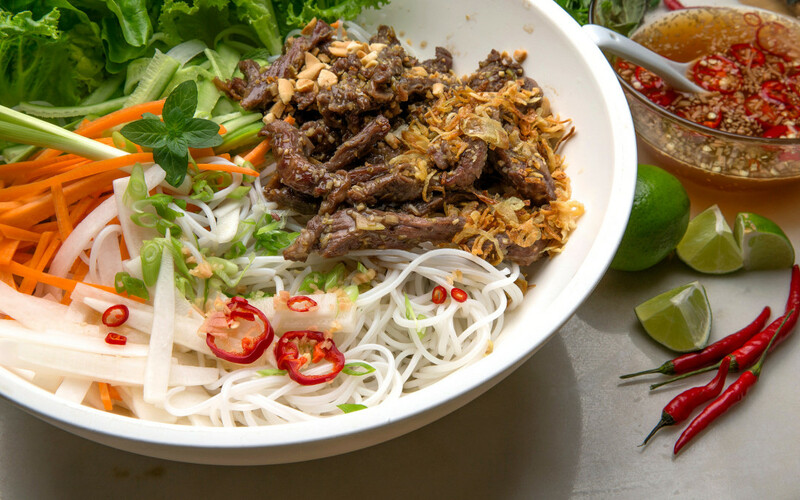 Add the grilled Beef strips, and garnish with the crushed peanuts. *Serve with Hoisin Sauce and your Scratch-made Fish Sauce.